of amazing people doing amazing things to improve our environment. The packed audience attending the Cork Environmental Forum Awards Ceremony at the Firkin Crane Centre on Monday last, 4th December, were moved by mesmerising stories extolling the commitment, leadership and dogged determination of all the Award recipients who are taking action to improve our environment. James O’Donovan, CEF, Chairperson, welcomed everyone to the Awards Ceremony. Proinsias O’Tuama from Ballycotton was the well deserving winner of the Outstanding Individual Award with his unstinting efforts to rid the beaches of East Cork of litter, pictured with his wife Lorraine O’Tuama who nominated Proinsias. John Sexton, who tirelessly removes litter from the streets of the Northside of the City, was commended for his work which stems from respect and love of the place he lives in. Pictured with Derry O’Farrell who nominated John. Michael Doyle, Colm O’Conor and workers from COPE were present to collect the Award under the Community & Voluntary Category for their project Duhallow REVAMP. A social enterprise delivering social, economic and environmental benefits to their locality. Deputy Lord Mayor, Cllr. Fergal Dennehy, presented the Awards under these two categories and praised the work being done in communities across the City and County. Pat Mehigan, nominator, pictured with Collette McKenna and members of the Love our Library Team at University College Cork who have made substantial reductions in their energy consumption and reduced waste through a creative campaign developed in collaboration with the students which garnered them the Public Sector Award. The Business and Commercial Category Winner was Maggie Minnion for The Filling Station which services Kinsale, Clonakilty and Skibbereen markets with a refill option for customers as well as a growing range of eco-goods in no or low impact packaging. Virginia Stearns and Donal O’Gara were commended for their business My Goodness which provides vegan, raw, gluten free, sugar free, dairy free, fermented probiotic products. They also harvest rainwater for their Keffir and other drinks range and now have a team of 9 people working on the business. A Lifetime Achievement Award was presented this year to Jim Wilson for the depth and breadth of his work over many years to wildlife and the environment. In accepting his Award Jim mentioned the support of family and the influence of so many people that he has worked with over the years but perhaps one that resonated with Jim were the word’s of his mother branding our beautiful world around us as paradise which still inspires his efforts, and resonated with everyone present at the Awards. CEF were delighted to have Anja Murray, ecologist and known to many as one of the presenters on the EcoEye Programme, to launch their new Sustainable Agriculture Category. Anja outlined the vital challenges that face the environment from our intensive method of producing food and the importance of recognising those who are incorporating better practices. Donal Sheehan, a dairy farmer in North Cork, has put in place many initiatives to encourage biodiversity and is demonstrating how dairy farming can be compatible with protecting and enhancing habitats. Donal spoke movingly about the species of birds that were present in the past on his farm but are no longer seen, as he also questioned how in a generation we have become desensitised to living in harmony with other species. Relaying a beautiful account from a 90 year old woman of how as a little girl she was taught from her parents to interact with nesting Skylarks and the imprint of this years later from having a real connection and respect for nature. Alan Kingston, a West Cork based farmer, who has embraced agroforestry as the future for his farm said what he is doing is not new but is considered so as it involves the planting of a lot trees in rows and combining traditional farming practices with forestry. He emphasised the important need for more trees, to learn from the land and to join the dots to create more wildlife corridors. Both are leading the way and great examples of how agriculture can be carried out in a more sustainable manner. CEF wishes to acknowledge that the introduction of such a category was a suggestion of Michael Ewing, Irish Environmental Network when he was adjudicating on the Award panel a number of years ago, however, until we interacted with Alan and Donal this year for Tree Week, Space week and other events we finally felt the time was right to launch with being able to showcase two such good practice examples. We look forward in 2018 to many nominations in this category. A word of thanks to our sponsors who readily came on board with financial and personal support for the event. 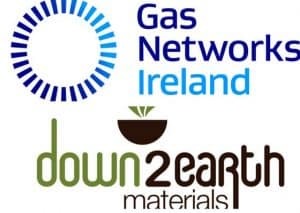 We appreciate the attendance of Donal Kissane, Gas Networks Ireland and Olan Hodnett and John Lynch, Down2Earth Materials, who also participated in the presentation of the Awards. We would like to thank nominators, who made introductions and other presenters not already mentioned above that include Klaus Harvey, Clair McSweeney, Joe Aherne and Clare Heardman. We wish to thank everyone who made nominations to the Awards in 2017, there was a great broad spectrum of interest and an almost record number of entries which in itself is a great indicator of the growing activity in the area of environmental sustainability. The adjudication panel, Justin Byrne, Irish Environmental Network together with Matt Jones, Helen Barrett and Denis O’Regan CEF, had the unenviable task of selecting the winners in each category and deserve great credit as all recipients are leading examples of the commitment and drive to improve the environment and have a lighter footprint whether a s an individual, a business or a group. 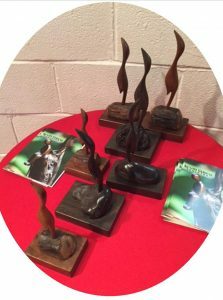 Thanks to sculptor, Kevin Casey, who supplied the prizes which are unique and individual bogwood sculptors created and carved from oak and yew wood buried for 1000s years beneath the deep midland bogs. Finally thanks to everyone who attended on the night, in support of recipients or from interest and support for CEF, there was not a spare seat to be had. Also appreciation to the Firkin Crane Centre, it’s such a perfect venue for this event and Ann, Liam and all the team there are so welcoming and helpful. We look forward with renewed energy and hope to 2018 and the possibilities that may arise in continuing to support and grow the number of amazing people doing amazing things in support of our amazing place on this one and only liveable planet. Annual Environmental Awards 2017 . The Annual Cork Environmental Forum Awards Ceremony took place at the Firkin Crane Centre on Thursday 8th December to honour people, actions and projects across all sectors of society who are contributing positively to a better environment and sustainability throughout Cork City and County. The CEF Awards are unique in the cross section of society they draw from with Individual, Public, Business and Community & Voluntary Categories reflecting the 4 Pillars the Forum is based upon as well as the Community Garden Award introduced in 2009. It is the breadth and diversity of these Awards that adds to the richness of the evening which is inspiring and motivating. The evening commenced with the Public Sector Award for the Cork Public Bike Scheme which was nominated by Derry O’Farrell and acknowledged the tripartite effort by the National Transport Authority (NTA), An Rothar Nua and Cork City Council who were collectively recognised for delivering the scheme which has been hugely successful in Cork. The Deputy Lord Mayor, Cllr. Joe Kavanagh presented the Award to Owen Shinkwin , NTA, Sean O’Dywer, Rothar Nua and Anita Lenihan, Cork City Council, Roads and Transportation Division. Owen Shinkwin in accepting the Award praised the success of the scheme in Cork and emphasised its role in providing for better sustainable travel options for people. Helen Barrett in her introduction of the Community & Voluntary Sector Award Winner Branch Out for their “Lets Plant A Forest” project in Clonakilty highlighted the fact that Ireland still has very low tree cover compared to other European countries. This project, on a 26 acre site, provided by Cork County Council, on the edge of Clonakilty, has been responsible for planting thousands of trees with the help of hundreds of members of the community over the past four years. Padraig O’Tuama, Coillte Team Leader Best Practice, in presenting the Award mentioned the examples in other EU countries where forests are much more available for general community use and are in the heart of cities such as Zurich. He complimented the group for their initiative as it is a great example of all sectors of the community coming together to implement the vision of having a public forest for all to enjoy in the future and this could be replicable anywhere in the country. Krisztian Gambos and Eylo Blaco key instigators of the project highlighted their love of the outdoors and nature and their passion for creating this space as well as the great cooperation from nurseries and businesses and the general public who join in planting every year. They were joined in accepting the Award by fellow members Cllr. Chris O’Sullivan, Paul O’Flynn and Istvan Markey. Istvan Markey, Paul O’Flynn, Chris O’Sullivan, Krisztian Gombos, Branch Out with Padraig O’Tuama, Coillte & Eylo Blanco Azofra, Branch Out. Previous CEF Award winners for their initiatives on waste and energy conservation Coolagown Development Group received a commendation under the Community & Voluntary Category for their inspirational Community Rainwater Harvesting Project. John Feeney presented an overview of the project which was motivated by the water charges being introduced and the fact that this small village relies on a group water scheme. This is again a great example of people having a good idea and everyone in the community working together to implement it. The capture of water in a country with lots of rain makes great sense and community projects such as this benefit everyone, Coolagown now has 15 public access points to water in the village available for all. Padraig O’Tuama presented the Award to John Feeney, David McAuliffe, Mattie Sheehan, and Barry Sheehan from the Development Group. In the Business and Commercial sector, the Baby Market won the Award for its approach and impact on sustainable living and delivering social and environmental benefits. Roger Nagle in his introduction mentioned how much waste can be generated during a child’s first few years and how expensive all the equipment and clothing babies require can be for new parents. The Baby Market which is a franchise business model provides a great outlet to channel almost new items that can be reused to people through 8 locations in Ireland. Michael McCathy, Abbvie, in presenting the Award to Angela Nagle praised the concept and importance of sustainability in businesses both large and small. Angela Nagle in accepting the Award mentioned the opportunity the Baby Market gave her as a stay at home mum to get back in the workforce and run a business that was compatible with her own circumstances and her interest in protection and care of the environment. The Community Garden Award, always a very competitive category, was introduced by Deirdre Collins who nominated the Allihies and Men’s Shed Allotments, the project displays the positive benefits of collaboration and involvement of the whole community whist combating rural isolation. A recent project highlighted was the pumpkin project in conjunction with the local school, one pumpkin reaching a size of 6 stone weight. These were showcased at the Childrens Halloween party at the Lehanmore Community Centre. David Dudley a member of the Men’s Shed stressed how remote and isolated their community is, 100 miles from the City, and the great benefit of the Men’s Shed itself but also in being more integrated with other projects such as the allotments both of huge social value. Frank Creedon, originally from the City now farming in Beara, said “nothing has brought me as much joy as being involved in the allotments”. Seamus Irwin and Johnny Morrissey also attended to accept the Award. A commendation in this category was given to the Knocknaheeny/ Holyhill Community Garden which continues to build horticultural learning and awareness locally and with the wider community. This project a previous CEF winner in this category continues to grow and evolve, managed under the umbrella of NICHE, the garden provides an important source of fresh vegetables to the wider community. Hilary Fitzgerald in accepting the Award mentioned the support from the men’s toolbox group and the link with the Arts project which has been very involved in transforming the garden at this time of year into a Winter Wonderland, using many reused and re-purposed items. John Paul O’Brien accepted the Award with Hilary. Thomas Riedmuller, The Hollies Centre for Sustainability, on presentation of both Awards mentioned that gardening and growing was so important not just in itself but by being engaged in a more personal way with the earth we can heal both ourselves and help heal the environment. The prizes, all from local artists, included collaborative pieces by artists Stephen Murray and Eadaoin Berkeley for the 4 Main Categories and Peter Little, Hortisculptures, for his unique sculpture from natural stone and wood, which this year was given as the Community Garden Prize. were thanked for their kind sponsorship of the Awards, the staff of the Firkin Crane Theatre for facilitating the event and Darragh Murphy for taking the photos at the event. Special thanks to everyone who took time out of their busy schedules to attend and support the Awards. “There’s so much going on we don’t know about and it’s so inspiring” was a repeated comment from people who attended the Awards Ceremony for the first time. Though we live in challenging times globally by acting locally in the way that all of the winners of the CEF Awards 2016 have shown we can make a real difference which as highlighted delivers not just environmental benefits but also social and economic improvements for our communities across the city and county which is real implementation of the principles of Local Agenda 21 and progress on our journey of sustainability. Congratulations to all the well deserving Award winners – all working hard to protect, care for and improve the environment of Cork to the benefit of us all. We are delighted to announce the winners of our Annual Environmental Awards for 2016. To find out more about these great actions and projects we invite you to join us at the Awards Ceremony on Thursday 8th December at the Firkin Crane Centre from 7pm. We will be honored with the attendance of the Lord Mayor, Cllr. Des Cahill and the Deputy Mayor of the County, Cllr. Kevin Conway. We congratulate all of the winners and extend our thanks to every person who took the interest and time to submit nominations for this year’s Awards. We are also grateful to Justin Byrne, of the Environmental Pillar and our own committee members who make up the adjudication panel for their time and commitment to the process. We would also like to thank AbbVie who have kindly sponsored the Award Prizes for 2016. All welcome to join in celebrating this years environmental heroes. Do you know an individual, group, public body, private company or school or community garden that is making a difference to the Cork Environment? Make a nomination so they may get the well deserved recognition & acknowledgement of their efforts. 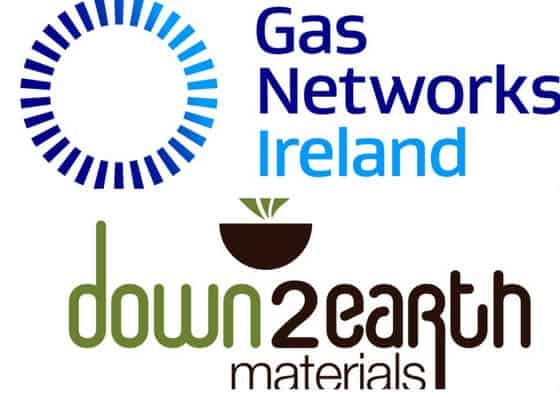 Cork Environmental Forum (CEF) is seeking nominations for their annual Environmental Awards. CEF has held its Environmental Awards ceremony since 2001 which aims to acknowledge and honour the sometimes little known actions of groups, organisations and individuals around the county that have contributed to the health or richness of the Cork environment. Awards are nominated under the four main pillars of the Forum , Public Sector, Business and Commercial Sector , Community & Voluntary Sector and Individual Category. A Community Garden Award has been in place since 2010 and this Award is now given under 2 categories – a school garden award and a general Community Garden Award – open to community gardens, allotments and other growing initiatives. CEF invites you to nominate those people, groups, public bodies and private companies who are making a difference and deserve recognition and an appreciation of their work. The nomination process is very straight forward, forms can be completed and submitted on-line on the CEF website at www.cef.ie through the Awards Button on the top of the home page. Scroll down to fill in either the general category form or the community garden category. You are also encouraged to submit photos or supporting material to bernadette@cef.ie. Deadline for receipt of nominations is Friday 30th September 2016. Adjudication is carried out by minimum 2 members of the CEF Management Committee and an External representative from the National Environmental Pillar. The award presentation will be the Firkin Crane Theatre in Shandon in December. The Annual Cork Environmental Forum Awards Ceremony at the Firkin Crane on 3rd December was an evening that reflected great commitment and hard work to create a better environment across all sectors of society with Awards given to Individual, Community & Voluntary, Public and Private Sector categories as well as a Communtiy Garden Award and for the first time ever in 2015 a new School Garden Category. This year the Forum also gave one of its Lifetime Achievement Awards. The Awards Ceremony promotes positivity and a can do attitude from all of the winners and recipients of the Awards. Dr. Darren McAdam O’Connell, Chairperson of Cork Environmental Forum, in his welcoming address referred to the fact that in this 20th Anniversary year of CEF global emissions had increased at an unprecedented level and that the environmental challenges we face are daunting but tonight we celebrate people who are making a significant contribution and making a real difference by their work, actions and the leadership shown across all categories of the Awards. Bernadette Connolly, Development Coordinator and MC for the evening thanked the Selection Panel, comprised of Michael Ewing, Coordinator of the Environmental Pillar and CEF members Denis O’Regan, Helen Barrett and Ruth Fortune. They had the unenviable task of choosing the winners from nominations that were all very worthy. Cork University Hospital Green Campus Programme was the winner under the Public Sector Category and was introduced by Helen Maher. The hospital has thus far shown great determination in being the first healthcare facility to apply for the Green Flag and successful attained this though their work in energy conservation measures, tackling waste and now engaging on further initiatives on food in conjunction with Cork Food Policy Council and transport. Edward Murphy who received the Award on behalf of CUH complimented the manner in which initially staff and now patients have responded and engaged with the programme, the initiative is both top down with great leadership from CEO Tony McNamara and Clinical Director Ken Walsh as well as from the ground up with staff across all sections engaging with actions to reduce CO2 and contribute to a truly sustainable healthcare facility. Deputy Lord Mayor, Cllr. Mick Nugent, who presented the Award congratulated the CUH campus for this pioneering initiative which is providing an inspiration to other healthcare facilities to follow suit and again following the example of UCC which was the first University in the World to get a Green Flag is also a global leader through the programme. John Ballinger introduced the winning project under the Community and Voluntary Sector which went to IRD Duhallow LIFE Himalayan Balsam eradication programme. He referred to the widespread problem of invasive species such as Himalayan Balsam and the model shown by the project in successfully tackling the issue along the River Allow. Fran Igoe in his acceptance speech referred to all of the work that had gone into the project and the wide range of stakeholders engaged in the process which involved IRD Duhallow staff but also Angling organisations, land owners, TUS and Rural Social Scheme workers as well as numerous volunteers. Deputy Mayor of the County, Cllr. Kevin Murphy, congratulated and thanked the group for their work which was a model that could be replicated across the county in acknowledging the importance of such community activism. Declan O’Mahony, the Outstanding Individual Award Winner 2015, who was nominated by Denis O’Regan with an introduction given by Bernadette Connolly was the recipient in acknowledgment and recognition for his educational documentary River Runner. The beautifully crafted film told through the experiences and understanding of Angler, Alan Nolan and ecologist Kevin Corcoran casts insights into what was and what could potentially be a wonderful river eco-system damaged by human interventions. Declan O’Mahony said the inspiration from the film came on meeting Alan and gaining a greater knowledge and understanding of the plight of the river through the perspective of the wild atlantic salmon whilst Kevin Corcoran’s insights into the special and rare place that is the Gearagh provided another aspect to the film. Declan mentioned the campaign he has spearheaded and efforts with authorities to look at remediation to the dam system, the film shows solutions adapted in other countries to address the barriers currently preventing the salmon reaching their traditional spawning grounds. Michael Ewing, Irish Environmental Network who presented the Award refereed to us as being just one species inhabiting and sharing the same planet with so many other species and if we don’t all begin to appreciate this and act accordingly we will continue to destroy the very systems that sustain us. The final Award under the main four categories was the Private Sector Award which went to AbbVie in Little Island. Derry O’Farrell who nominated AbbVie mentioned their longstanding commitment to sustainable practices within the business and the hard work and commitment with ISO standards but more recently and the reason for the Award two initiatives which have led to a huge reduction in energy costs, CO2 emissions and a better sustainable trajectory for the future, the installation of a locally sourced biomass wood chip boiler and HVAC cooling system. Michael McCarthy, AbbVie Project Engineer referred to the fact that as an organisation pharmaceutical production is the primary focus but that the organisation also has a strong policy to increase its sustainability and strategically works on this. Keith Neary, Brookfield on presenting the Award referred to the individual commitment of Michael McCarthy, Peter Power and colleagues for taking the initiative and pushing though these projects within the organisations which are making such a substantial contribution. The Community Garden Award Winner for 2015 was the Cobh Community Allotments. Nominated by Helen Cadogan, who gave a heartfelt introduction to the Allotments which truly reflect a project which welcomes and embraces the wider community of Cobh. Helen is not a plot owner but regularly visits this gardening space which is a place to share gardening experience but also a great space for broader social contact with the community. Anne Mallon in her acceptance on behalf of the Allotments mentioned the ethos of the project which commenced 4 years ago but was always about being as in touch with nature as possible, whilst there are 50 plot holders there are also community shared spaces such as a poly-tunnel and facilities such as the cabin and water-harvesting and solar panels. The IRD Duhallow Community Gardens received a commendation for their garden which initially served as a Therapeutic Outreach programme for people suffering from mental health issues. Rachel Budd explained how successful gardening can be as a therapeutic space and how the garden despite difficulties of being displaced has survived and grown now featuring a kitchen garden and orchard. Rachel emphasised the manner is which the gardens are run on a very low budget with volunteers contributing by seed saving, sharing plants and materials. The next Award was presented to Scoil Ursula School Garden in Blackrock. The stars of the evening were Gavin and Victor who introduced their garden to a capacity filled auditorium with such wonderful poise with their own pride enjoyment and enthusiasm for the garden clearly evident. They were so inclusive with their thanks to all the staff at the school, including Rose Magner and all those involved who have helped develop the garden and make it a focal point at the school. It is clear that the garden is at the heart of the school activities and is inclusive of pupils, teaching staff, parents and the wider community. Gill Weyman, Cork Nature Network, who kindly at short notice stepped in to present the garden Awards, mentioned the opportunity gardens give and especially with young people to learn about nature and biodiversity. The final Award of the evening was the Lifetime Achievement Award which was presented to Matt Murphy, Sherkin Island Marine Station for over 40 years of an amazing contribution to ecology and greater understanding of the environment around us. Michael O’Brien, Senior Engineer, Cork City Council in his introduction referred firstly to Matt’s very strong family focus and priority and following that gave a revealing and broader perspective of Matt’s endeavours as a young entrepreneur. However Matt found his true calling in life with the setting up of the Marine Station in 1975 on Sherkin, with his wife and seven children. Matt Murphy is a leader in his field and has helped so many people develop greater insight and understanding of the natural world through surveys and research and the wonderful international conferences bringing people from far and wide to share new ideas and broaden. Matt in his acceptance speech which was warm and humorous referred to the importance of long term monitoring of nature, how crucial it is to engage with children and develop understanding and knowledge at an early stage in life, of the 600 + biologists who came to Sherkin over the years and that there was a team of people including his children who had helped in the work and in their achievements. Liam Lysaght, Director National Biodiversity Data Centre who presented the Award said he was delighted to be associated with the Award to Matt Murphy whom he had worked with and respected his significant contribution made with less funding and that essentially Matt Murphy is a national treasure we are luckily enough to reside here in Cork. Despite traffic problems in the city which played havoc with some presenters not able to attend the evening was a great success. Bernadette Connolly, CEF Development Coordinator gave details of the prizes, all sourced form local artists, the four main categories and the School garden will receive a sculpture crafted from local stone by Peter Little of Hortisculptures and they are all unique pieces. There is also a large perpetual sculpture by Peter which Community Garden winners get to keep for a year. Martha Cashman is the creative artist responsible for the ceramic piece being presented for the Community Garden and Tess Leak is the artist of the print for the Lifetime Achievement Award. Bernadette congratulated all of the winner s and thanked all those who participated in the introductions and presentations as well as all who attended what is a highlight event in the year of the Forum. She thanked Musgraves for their sponsorship of the refreshments and the volunteers who helped prepare the reception. She also thanks Andy Ferreira for taking the photos. The Award winners give a cross sectoral flavour of the environmental care and concern in our communities across Cork and it is heartening to know that this is just a sample of all the work happening in this area. Collaboration was a common theme across all of the activities and if we can continue to work in this way we will perhaps further efforts in delivering true environmental sustainability. We wish to thank all the people who have agreed to introduce the winning projects and the presenters of the Awards. We would like to thank everyone who took the time and interest to submit nominations to our Annual Environmental Awards. The adjudication panel have met and as always it is an unenviable task to choose a winner as all nominations merit acknowedgement in their own right. However, the decision has been reached and we can now announce the Award Recipients for 2015. Sincere congratulations to all, it is through such dedication and hard work that so many people across the differnt sectors and strands of our community take action to make our environment better and lead by example. The Awards Ceremony will take place at the Firkin Crane Centre, Shandon, Cork on Thursday 3rd December from 7pm. It is a celebratory and social occasion and open to anyone who wishes to attend. The event provides a very good opportunity to hear from all these wonderful people and projects and encourage more partiicpation in the nominations in the future. Carol Gilbert joined by the Deputy Lord Mayor, Cllr. John Kelleher and Mayor of the County, Cllr. Noel O’Connor, receiving the Lifetime Achievement Award from Clair McSweeney, CEF with Walter Ryan Purcell who nominated Carol for the Award. 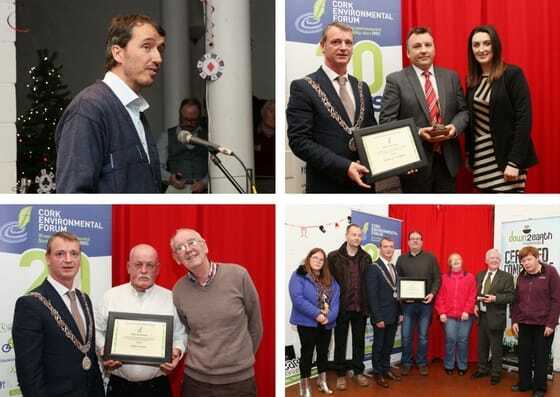 Cork Environmental Forum honoured the shining lights of environmental care and action in Cork city and county at their Awards Ceremony at the Firkin Crane Centre in Shandon last Thursday 5th December. As always the evening was a very positive and inspiring occasion as the individuals and projects acknowledged and recognised for their work and commitment to the environment exemplify what can be done and the power that both individuals and people collectively can have to change to a more sustainable way of living. Congratulations to all the winners and those receiving commendations. Thanks also to the people who took the time to submit all of the nominations. Thanks to the Firkin Crane Centre, to Tom Barry’s for the wine and to Andy Ferriera who took the photos throughout the evening. Prizes for the four main categories and the Lifetime achievement received a sculpture of bog pine and stone crafted by Peter Little of Hortisculptures and they are all unique pieces. There is also a large perpetual sculpture by Peter which Community Garden winners get to keep for a year. This year the Community Garden prize is aptly two ceramic spades designed and crafted by Martha Cashman, with driftwood handles and design imprints that used amongst other items sunflower seeds. Amongst the distinguished guests at the Awards Ceremony that participated in the presentations were the Deputy Lord Mayor, Cllr. John Kelleher, Mayor of the County, Cllr.Noel O’Connor, Dr Shane Colgan, EPA, Mr Dermot Cunningham for CIT Clean Technology Centre and Ms. Colette O’Flynn, National Biodiversity Data Centre. 2013 is the 13th year of the Awards. Including tonight 59 awards will have been presented by Cork Environmental Forum. Tonight’s Award winners and the cumulative impact of all those honoured in previous years is no small thing, it is a benefit to all of society that we have so many people working collectively to protect and care for our environment and raise awareness of the huge challenges we face . Cork is lucky to have this level of activity and it bodes well for the future if we can continue to build on all that has been achieved. The Award Winners and those receiving special commendations are spread throughout the city and county. Individuals, Gill Weyman and Nick Becker who are a shining example to others of their commitment, energy and drive to improve the biodiversity of the county and the environment of their community to groups such as Transition Town Kinsale and the Cork Cycling Festival who see the bigger picture, raise awareness and implement actions and projects to address some of the challenges we all face such as Climate Change, a business such as Gills Chip Shop that takes on responsibility to change purchasing of materials to more environmentally friendly products, and a student led University project, the UCC Green Campus Programme, which has made it a world leader. From community and school garden projects in Knocknaheeny and Colaiste Chriost Ri that have both transformed waste and unused ground into productive growing community learning spaces. Finally, an individual such as Carol Gilbert who has promoted and supported sustainable development through so many projects and in so many ways over her lifetime. These are the special people whose work and commitment to protect and preserve our environment and make our communities better places to live which we all benefit from. Guests who will participate in the presentation of the Awards include the Deputy Lord Mayor, Cllr. Lorraine Kingston, the Mayor of the County, Cllr. Noel O’Connor and representatives from the CIT Clean Technology Centre, the EPA and the National Biodiversity Data Centre. This is a public event and we invite you to join us in acknowledging and celebrating these wonderful individuals, projects, community groups and institutions. 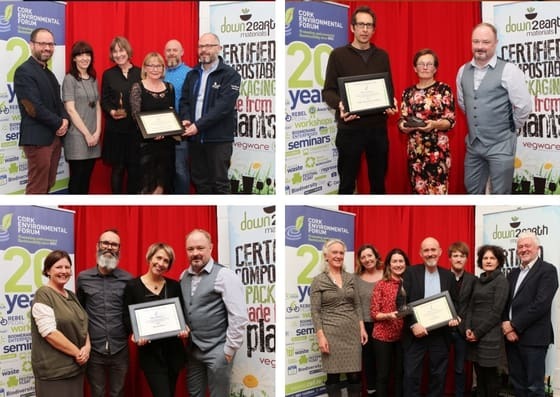 Cork Environmental Forum is delighted to announce the winners of their annual Environmental Awards and extend an invitation to members of the public to the presentation ceremony and social evening. The quality and range of recipients who have won or received a commendation in 2013 is a reflection of the wealth of activity and commitment to environmental care throughout Cork City and County. For a lifetime promoting and contributing to sustaining a resilient regional environment in West Cork. 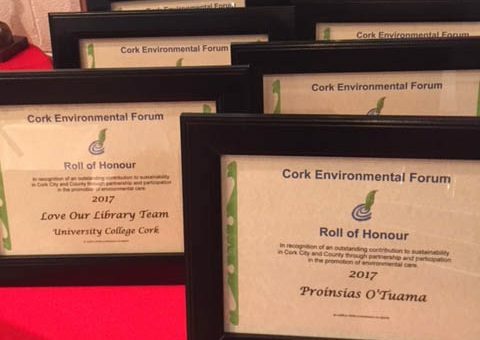 Established in 2001, the Cork Environmental Forum Awards honour the sometimes little known actions of groups, organisations and individuals around the county that have contributed to the health or richness of the Cork environment. The awards are split into different categories according to different pillars of society, nominations are accepted from CEF members and any member of the public for actions that are in keeping with the spirit of sustainable development and community resilience. CEF introduced the Cork County Community Garden Award in 2009. The Awards presentation will take place at the Firkin Crane Theatre in Shandon, on Thursday 5th December 2013, starting at 7 pm. The event will include a wine reception with light refreshments. Awards Nomination Deadline Extended to October 17th – please submit by 5pm. Please submit nominations for all of the wonderful environmental care and action in Cork being carried out by public institutions, the business and commercial sector, community groups and individuals. The CEF annual environmental awards were established in 2001 to mark the outstanding contribution of individual citizens, organisations and businesses to the preservation or improvement of the environment of Cork City and County. 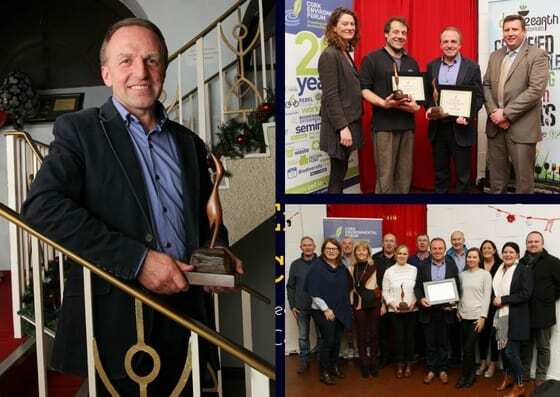 Amongst the many past winners are Noel Dillon (Individual Category) , ex-County Manager for his vision in helping to establish CEF in 1995; Sustain West Cork (Community & Voluntary Category); Cork City and County Heritage Officers for Biodiversity Plans (Public) and Avego (Private) for their car sharing app. and submitting to bernadette@cef.ie . See below for Community Garden Nomination Form. All nominations are considered and the winners chosen by a selection panel. The awards ceremony will be held on the evening of Thursday 5th December 2013 at the Firkin Crane, Shandon, Cork City. Deadline for receipt of nominations has been extended to 17th October 2013. The Lord Mayor Jerry Buttimer presents the award for best Community Garden to Churchfield Allotments at the C.E.F. awards. Commendation: Mervyn Horgan, James Goulding and Brian O’Flynn, Cork City Council – Tramore Valley Park Open Day pictured with Michael O’Brien and Michael Reck (Cork City Council) and Tony Foy, Grange Frankfield Partnership. Olive O’Brien, writer and publisher. Phoebe Bright, who accepted Richard’s award on behalf of Mary Douthwaite, paying tribute to Richard’s valuable work and contribution. Conor Kelleher was the CEF Award Winner under the Individual Category at the Annual Awards Ceremony last Thursday night. We have had enquiries regarding the DVD “The Bats of Ireland” which is a joint initiaitve by Conor and other well know local wildlife expert, Jim Wilson. Conor can be contacted directly to order a copy. All proceeds to Bat Conservation Ireland.